Photo provided by Stanimir Morfov. 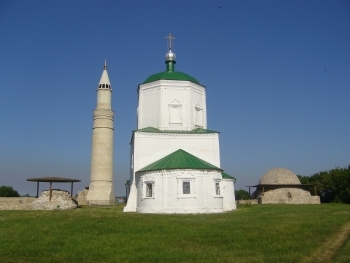 The Bolgar Historical and Archaeological Complex is testimony to a medieval civilization and an important pilgrimage destination for Tatar Muslims. It was the settlement of the Volga Bolgars, which existed between the 7th and the 15th centuries. Central feature of the site is the (reconstructed) historical mosque. There also are a number of mausoleums. Visited this site in August 2017 with day-trip on a rented car from Kazan. The site includes a number of ruins and restored monuments mainly dating back to 13th-14th centuries (however, the site was inhabited since 7th till 15th century). Interesting that in 922 Bolgar was visited by a mission from Baghdad (well documented) after which Bolgar accepted Islam as official religion. Bolgar was capital of Volga Bolgar civilization at the crossroads of evolving Russian state and Asia. It is noted in the Unesco assessment that the number of restoration works and interventions is high and it's visible. However, several surviving buildings are quite unusual and interesting architecturally. 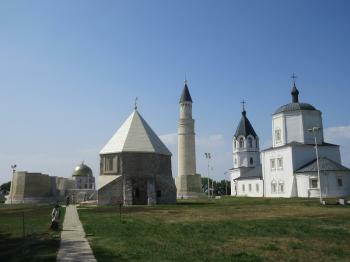 The site is well maintained, the monuments are labelled with information in Russian, Tatar and English. There is also ongoing archeologoical research and through the fence one could glimpse at 3-4 meter deep excavation works. There is also mosque called Memorable sign built in 2012 to honour anniversary of Islam acceptance, where the largest Koran in the world is kept (weighing 800 kg). Brand new museum of Bolgar civilization has a number of artefacts and information, as well as model of the city. It would take around 2-3 hours to see all the monuments. The overall area was quite touristy and visited by the large groups of locals. Also there is another recreation area with some ruins and museum of bread located around 3 km to the south of main site, which could be of interest as well. In overall, not an overwhelming site, but still a pleasant historic place, probably the only remaining evidence of a past Volga Bolgar civilization. It is strange that according to this site Bolgar is one of the least visited WHS in Europe, as the place is very popular during summertime. Probably the reason is that most users are from Western Europe and few of them explore Russia, especially places distant from Moscow or Saint Petersburg. Bolgar is the most significant remnant of Volga-Bulgarian Kingdom, ruling this part of Europe from X to XIII century. Bolgar was the capital of that kingdom and the place where they took Islam as their religion. It seems that current policy of Tatarstan is to praise local and Islamic elements, so the site was recently largely renovated, however excavation works are not finished yet. There are many well-preserved buildings in Bolgar, such as several mosques and mausoleums and remainings of Khan’s Palace. The site is quite large and to visit all inscribed sites it is necessary to have at least 2-3 hours. You may cut this time significantly by renting a bike (100 rubles per hour) which I did. The whole site is very nice and the view on Volga river banks is really stunning. Bolgar is located about 180km from Kazan, but getting there during summertime is not an easy task. I tried the speedboat (once per day) but the tickets were sold out for the next five days. Bus tickets from the central station (near the river boat station) were sold up to three days. Fortunately, there was one remaining ticket for that day from south bus station (Yuzhnyi Avtovokzal) located in the southern suburbs of Kazan. I strongly suggest booking the tickets in advance, at least during summer. Rented car is also an option (be not afraid of Tatarstani roads, they are good, but beware of police frequently controlling speed) and even without GPS getting there should be easy - road signs to Bolgar are numerous. There is also possibility to get there from Ulyanovsk, located about 130 km south of Bolgar. a few different Mausoleums, a courtroom building that became a smokehouse (Black chamber), the White Chambers with its bath installations.There is also a good museum at the new Shipyard. Exhibits are mostly from the excavations in Bolgar itself. Work is still going on. every day.However, they could not provide me with a return ticket.At the end, I was unable to return to Kazan with the speedboat, but had to arrange a shared taxi. 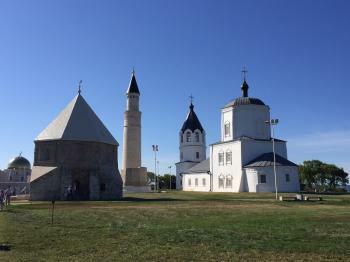 Built in the 10th century: The historical and archaeological complex of Bolgar is a symbolic reminder of the acceptance of Islam by the Volga-Bolgars in 922 AD (Nom File). Reconstruction regarded as unsatisfactory by UNESCO or ICOMOS: authenticity of the reconstruction of the Great Minaret (2001) & past conservation activities at the property which included reconstructions and partial rebuilding works (Nom File).